"He who has not seen Granada, has seen nothing" - popular saying. Granada is an enchanting city, lying at the foot of the impressive Sierra Nevada mountain range, the highest in Spain. It was the capital of Spain’s last Moorish kingdom, before it was re-conquered by the Catholic Monarchs in 1492. As a result, Granada has an unmistakable Arab flavour. Its cuisine, crafts and urban layout are a consequence of the city's glorious history and give it a unique charm. To experience this, all you need to do is stroll around the narrow cobbled streets where you stumble across the atmospheric 'teterías' (tea shops) serving a full range of teas, including the mint teas so typical of North Africa, served in an unmistakably Moorish environment. Add to this the many fountains, viewpoints, Cármenes (the villas surrounded by gardens typical of the city) and the spectacular views to the surrounding snow-capped mountains, and it is easy to see why Granada attracts visitors from all around the world. Granada is, of course, home to the Alhambra and the Generalife gardens, which together with the Albaicín, one of the oldest districts in Granada, have been declared World Heritage Sites by UNESCO. The Alhambra Palace is an artistic gem of Arab Granada, built between the 13th and the 15th centuries. Today, the monument is divided into four main areas: the Nasrid Palaces which are composed of many rooms linked by courtyards, gardens and fountains, the military zone or Alcazaba, the city or Medina and the Generalife, the summer residence of the Nazarite Monarchs. Other notable buildings belonging to a different time period are also included, such as the Renaissance style Palace of Charles V, which houses the Alhambra Museum (most of the items are from the site of the monument) and the Fine Art Museum. Due to the popularity of this attraction, advance booking is recommended. Click here for more information on visiting the Alhambra. If you want to enjoy the experience of the Alhambra Palace to the full, then a stay at the Parador within its grounds is a must. The Parador is a converted 15th Century Convent, built by decision of the Catholic Monarchs. Also situated within the grounds of the Alhambra is the 4 star Alhambra Palace Hotel, inaugurated by His Majesty King Alfonso XIII on the first of January, 1910. 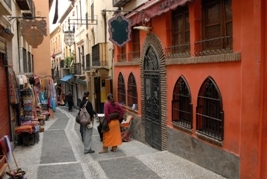 Other main attractions in the city include the Albaicín, one of the oldest quarters in Granada and one that has also been declared a World Heritage Site by UNESCO. Its steep narrow streets lead up the Mirador de San Nicolás from where there are magnificent views of the Alhambra. Set on one of the other hills in Granada is the Sacromonte district, a gypsy quarter which is home to cave-houses, whitewashed with a mixture of copper and lime, and with its alleyways decorated with gardens of cacti, carnations and jasmine. 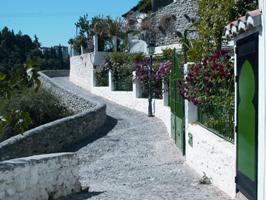 This district is also where you will find the "zambras" (Flamenco dancing). 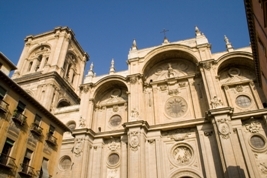 Among the monuments worth visiting are the 16th century Cathedral, one of the most beautiful examples of Renaissance style, the Corral del Carbón, an old Arab corn exchange, which is the present site of the Andalusian Legacy Foundation, and the Plaza de Bib-Rambla, famous for its flower market. Also of Arab origin are the Alcaicería (silk exchange), an ancient souk where nowadays you can buy regional crafts; and the Palacio de la Madraza, an excellent example of Muslim architecture. Granada has a great diversity of protected natural areas. The Parque Nacional de Sierra Nevada features the highest peaks of mainland Spain, but there are also five natural parks surrounding the city. The coast is also reached in around 45 minutes, which is why it is often said about Granada that you can ski in the morning and relax on the beach in the afternoon. The Sierra Nevada, the main ski resort in the South of Europe with the highest number of sunny days per year, is a real paradise for the lovers of winter sports. It is equipped with the best facilities in Spain for skiing, snowboarding, snowmobiling and even dog or horse sledding. The resort hosted the World Alpine Ski Championship in 1996 and the World Cup Ski Finals in 1999 and receives thousands of visitors to its slopes each year. It is equipped with the most modern facilities and has a long season which stretches from autumn to early May. In the summer months the resort is used as a base for walking, horse-riding and mountain-biking. At the foot of the Sierra Nevada, facing towards the Mediterranean, stretches the land that was occupied for more than 800 years by the Moors. This Islamic presence has set an indelible stamp on the district. A trip to the western part of the Alpujarra, known as the Valle de Lecrín, takes us to an orchard with crops and small villages which have kept their 'morisco' or Moorish essence over the centuries. The high Alpujarra takes us up into a land of picturesque villages perched on mountain slopes, ranging from Lanjarón up to places such as Pampaneira,Trevélez, Válor, and onto Laroles on the border with Almería. The Costa Tropical enjoys a privileged ecosystem, thanks both to its southerly orientation on the shores of the Mediterranean and to the shelter provided by the Sierra Nevada which rises to a height of more than 3000m, protecting it from northern winds. The mean annual temperature is 20 °C, ranging from 14 °C minimum to 32 °C maximum, so the weather is never cold nor does it reach the more stifling temperatures found in inland Spain. The closest beach town to Granada is Motril, although Salobreña and Almuñecar are close by and have better beaches.